No one would blame you if you thought this podcast and these podcasters somehow got . . . um . . . lost on a lost continent, but the truth is much more mundane. You’ll hear about that, and the film The Lost Continent (dir. Michael Carreras, Leslie Norman), in this episode. It’s the triumphant return of 1951 Down Place, and two-thirds of the Down Placers! 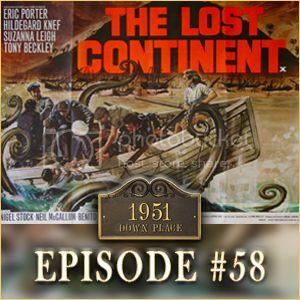 Download 1951 Down Place: Episode #058 here!